360 MALL has won the International Council of Shopping Centers’ coveted Gold Award for Innovative Design and Development of a New Project for 2011 for the Middle East and North Africa. The ICSC Global Awards program recognizes the best shopping centre design and development, marketing, and retail programs from around the world. Recognized as the benchmark for excellence in the industry, the Global Awards were presented at a glittering ceremony organized by the Middle East council of Shopping Centers at the Armani Hotel, Dubai on the 28th of November amidst an august audience of regional and international shopping centre developers and operators. The award was received by Mr. David Boesley - Chief Operating Officer of GLA Property Management Company, the Manager of 360 MALL. Gold Award winners from each region, including 360 MALL will be automatically entered into an international competition for the Viva (Vision, Innovation, Value, Achievement) Best-of-the-Best Awards to be held in the USA. 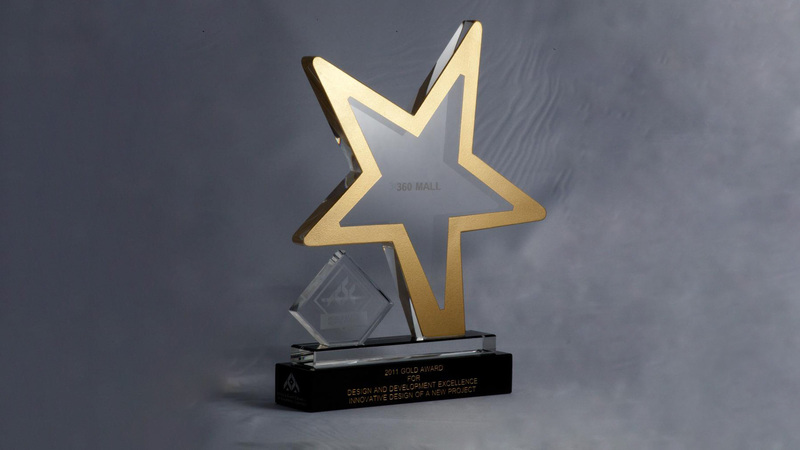 RTKL Associates Inc. the USA based designers of 360 MALL were recognized at the award function for their design through the International Council of Shopping Center’s Gold Award. RTKL has created values of the brand through a meticulous design process to create one of the largest and most dynamic retail destinations in Kuwait. The design is a modern interpretation of traditional Middle Eastern form, colour and pattern, rendered in materials fit for a national landmark. The circular layout celebrates Kuwait’s cultural ties to the Arabic art of navigation. Its rich interior spaces, state-of-the-art technology and powerful design elements set a new regional and international standard for shopping centre design and development. 360 MALL integrates retail, leisure and entertainment in a luxury environment; positioning it as the premier luxury shopping experience in Kuwait offering shoppers and visitors 82,000 sq.m of exciting leisure and shopping experiences. Amongst its stores are a mix of luxury brands, dining and entertainment which have been introduced for the first time in Kuwait The mall’s elegant interiors include seven different experience zones. The 360 MALL marks a milestone in the growth of the retail sector in Kuwait and is clearly a turning point for the industry.